Assessment has been a constant discussion topic across IOE and UCL, with a strong drive to diversify assessment methods. Technology is often used to facilitate diversification and to manage scaling and workload. This short series of knowledge exchange seminars will explore selected assessment methods, both formative and summative, that support learning from an academic viewpoint, and we will contemplate the aims, benefits and challenges of these approaches based on experiences from academics with ample room for discussion. This seminar series is open to all. This session explores options for more diverse assessment, and practices as well as challenges in using assessment to facilitate and measure learning. Bring your own examples, questions, or views. Online participation is possible. If you want to participate online, click this link at the appropriate time to access Blackboard Collaborate Ultra. Monday 26th November 12noon will see the conclusion of this term’s LTU Seminar Series on Accommodating the Distance Learner with a practice exchange workshop. We are attempting to run this workshop in hybrid mode with both face-to-face and online participants, so please join us either in Room 604 at the UCL Institute of Education or online via the link above. The first panel discussion in the Autumn term LTU seminar series Accommodating the Distance Learner took place on Friday 9th November. Watch the recording below or on MediaCentral, or read the full transcript. The Text Chat Protocol is also available. The discussion touched on a number of issues and revealed occasionally surprising insights that have an impact beyond distance education. Some of these themes are summarised below. With options to study part time or flexibly at IOE, the boundaries between face-to-face students and remote students have become blurred. 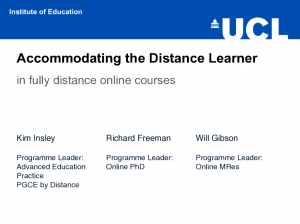 According to Richard Freeman, a Postgraduate Research Experience Survey showed that even before the launch of the Online MPhil/PhD, close to half of the respondents (41.5%) were self-identifying as distance learners, despite no distance programme being offered at the time in this area! We see similar tendencies, albeit not on this scale, in postgraduate taught programmes, where students occasionally register for face-to-face attendance to secure access to sessions in person, while effectively being a distance learner after the start of the programme. Distance education appears to be more prevalent than registry data suggests. While this is a vote of confidence in the IOE’s student support systems and overall flexibility, this mismatch between registration data and reality poses a danger to informed decision-making when it comes to funding the teaching provision. Programme leaders were adamantly emphasising that distance learning programmes were the same in terms of status, value and academic rigour as face-to-face programmes, and not in any way second rate, or a ‘secondary choice’ option. This was an important point, as comparisons to face-to-face provision are still the norm. In terms of student experience, Richard Freeman pointed out that distance learning is equivalent to face-to-face, but not identical. Direct in-person contact has characteristics that are impossible to capture at a distance, for example around the immediacy of conversations, or when hands-on work is required. But Will Gibson found that educationally, face-to-face makes it more difficult to achieve what he wants to achieve, mainly because asynchronous online discussions stretch conversations over time, which forces students to think about things. The time to think was raised by the other programme leaders as a beneficial characteristic of distance education, which has no room in fast-paced face-to-face seminars and lectures and needs to be ‘outsourced’ to homework or independent work. While face-to-face classes could obviously also use online forums to stretch thinking time, we see that these tend to have much lower participation rates, whereas they are a highly-used core component in distance education. All programme leaders agree that face-to-face and distance learning are different, but neither mode is necessarily better than the other. Both modes, while based on identical learning objectives, offer equivalent opportunities for engaging with content, concepts, staff and students. The concept of equivalence occasionally raises some practical issues: Kim Insley reported an in-depth discussion during programme validation about the online equivalence of attendance, which IOE stipulates at ‘80% of all sessions’. Kim uses five Keep In Touch (KIT) activities per module as dedicated attendance monitoring points, which do not necessarily need to be completed at set dates. Other programme leaders follow a stricter timeline-dependent approach and use monitoring functions provided by the Virtual Learning Environment (VLE). A common attitude of people unfamiliar with distance education is an inherent assumption of ‘social’ distance alongside geographical distance. All three programme leaders agreed that this could not be further from the truth: Kim Insley stated that she knows what’s going on inside the heads of her distance learners, because they are telling her, whereas face-to-face students do not necessarily do that. Will Gibson felt he knew his distance learning students much better than face-to-face students, due to an ongoing conversation, as opposed to weekly or fortnightly meetings with not much contact in-between. These conversations include personal interests and issues, and tutors develop a sense of the students’ voice, which is important pedagogically. Richard Freeman reported that distance learners often drop in to say hello while traveling through London. The personal connection, including the sense of a student’s voice, ie getting to know their writing style, also addresses plagiarism; both Kim and Will agreed that knowing students makes plagiarism, usually accidental plagiarism, obvious, and it also supports decision-making when the plagiarism checker throws up issues. To accommodate distance learners, the various supporting service departments of an organisation must play their role. Programme leaders praised a genuine interest, sometimes verging on excitement, from support departments in improving access to their services for distance learners. A key rationale was that better access for distance learners will automatically benefit face-to-face learners and the wider university community as a whole. Specifically, the efforts and willingness from IOE Academic Writing Centre and Library Services were highlighted, but generally it was felt that other services, despite not always being perfect, were accessible to distance learners, or open to introduce more flexibility. UCL’s strong profile for open access, open education and open science was regarded as a key driver for a generally supportive organisational culture. Overall, the biggest help for distance education students appears to be provided by administrators: Richard Freeman highlighted their unique role, as they are seen as more neutral as well as highly knowledgeable about the support options that are open to students, contributing significantly to the overall pastoral support. Will Gibson, having previously mentioned quick video summaries, highlighted weekly bulletins as a simple but effective means of guiding students through a course. Written in an informal tone, bulletins provide light orientation prompts to keep students focused and to enhance the social presence. Richard Freeman mentioned the wide success of the flipped classroom approach, which means offloading content acquisition/lecture aspects to videos and using session time for working on clarification of concepts and understanding. But he also warned that distance education is not for everyone, not for every topic, and not a universal solution to everything: “It’s not about how to make the best online course, it’s [how to make] the best course” – depending on context, this may be face-to-face, blended or fully online. Kim Insley mentioned the impact of her pre-course handbook, which is circulated to students before they even start their course and helps greatly with setting and managing expectations. This idea has caught on and has been introduced elsewhere since. A variety of other issues were discussed and can be reviewed on MediaCentral, including the full transcript and text chat protocol. Detailed accounts such as these help identify issues and improve their understanding in distance education and beyond. Do you want support in improving your distance education programmes, or are you thinking about providing distance programmes? Across the IOE and UCL, we use various ways to accommodate distance learners academically. This series of knowledge exchange seminars will explore existing experiences as well as contemplate challenges and opportunities of distance learning in different contexts. Whether you run or are interested in online or mixed mode teaching, this series is open to all. Key questions around distance learners in fully online modules. Key questions around distance learners in simultaneous face-to-face and online modules. How do we learn on a MOOC? 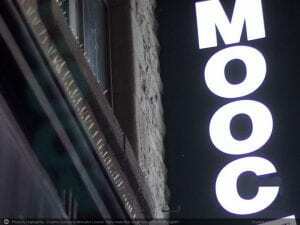 Do your students take MOOCs as part of their learning? Diana Laurillard and Eileen Kennedy from UCL Knowledge Lab (UCL Institute of Education) are undertaking a research project on the transformative potential of MOOCs and contrasting online pedagogies with the Centre for Global Higher Education. They are hoping to find out how people learn on a Massive Open Online Course. They are particularly interested in how learning on a MOOC is different from or similar to other forms of online learning, taking a more in-depth approach than most current MOOC research. In particular, Diana and Eileen are keen to talk to current undergraduates about the way learning on a MOOC is similar to or different from other kinds of online learning. This will inform the way we create MOOCs in the future by helping us design in more features that are supportive of learning and change others that are less so. If you recommend MOOCs to your students (undergraduates or postgraduates) it would be very helpful if you could put a notice in your Moodle site to invite your students to take part in the research. In return, Diana and Eileen are happy to share their results with you which could help with your evaluation of your use of MOOCs in your teaching. Academic staff at IOE are encouraged to fill in a short survey about electronic grading and feedback practice. Led by CPA E-Learning Champion Dr Mary Richardson, we have designed a survey to explore how academic staff assess student work online and how you provide feedback via Moodle or other online settings. The results will provide us with valuable information with the view to designing targeted support, strategic planning, and improvements to workflows. Please find more information including the link to the survey on the IOE Staff Intranet (restricted access). Are you interested in joining the UCL E-Learning Champions scheme? With the structural changes at the UCL Knowledge Lab, we have lost our existing web presence. We aim to transition some of the old content over to this site, but as we are a small team, this task may become a victim of prioritisation over the coming weeks. For general information about E-Learning, the UCL Digital Education blog is a valuable resource.